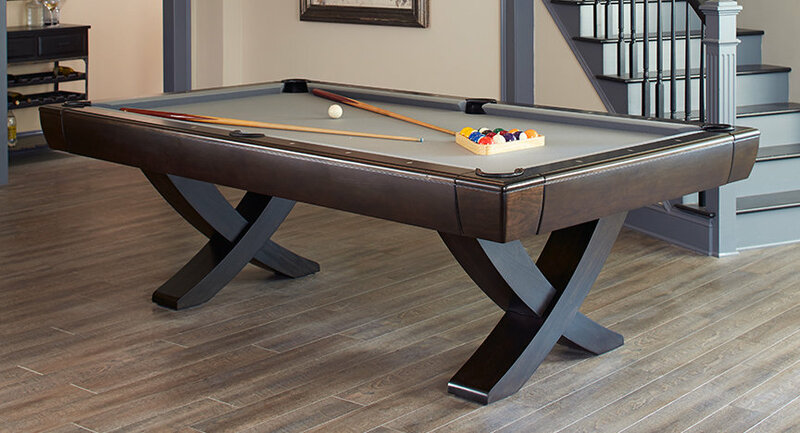 The Newport Pool Table features a modern upscale double pedestal structure, combining soft lines with a clean design for upscale game rooms. The Newport is a California House original, inheriting all of the great qualities the brand has maintained over the years. The playfield is composed of a 1″ thick 3-piece slate, diamond honed and backed for maximum durability and reliability. The frame and base of the pool table are made with 100% solid kiln-dried hardwood, adding even more strength to the sturdy design. The chassis is factory pre-assembled, providing incredibly precise leveling for superior play. The Newport also has accurate K66 profile cushion, bringing fast rebounds to the table. The multi-step, post-catalyzed lacquer finish results in a transcendent beauty that resists wear and tear. You will be able to pick from among 30 wood finishes and 18 felt cloth color options to infuse your character into your table.